Democrat Todd Gloria is the acting mayor of San Diego and chair of the City Council budget committee. He has performed a public service by providing a breakdown of the city budget deficit for 2015. Bottom line, the budget has a deficit, but that deficit will be made worse by spending promises made by the city council over the past few years. I like the Voice of San Diego headline: Gloria Reveals the Cost of Saying Yes. The U-T reports that just maintaining the current level of services results in a projected deficit of $19 million next year. Adding in promises made by the City Council would increase the deficit to $62 million and infrastructure repairs add another $16 million. Gloria has done a service by clearly laying out the impact to the deficit of all the promises made by the city council in the past. What should the city council do? What do the mayoral candidates say? Here are some unfair and unbalanced synopses. Faulconer: Find money by increasing managed competition. Alvarez: It’s not that bad. Aguirre: Are you kidding? That deficit is probably $200 million based on our needs. I believe that we should look at savings in existing services. Failing to review services that are no longer needed or are not needed as much is a known path to finding investment dollars in big businesses. I also like managed competition, because even when the government employees win the bid, money is saved. Although the focus of the newspaper articles is on the deficit, consider that the overall general fund budget is $1.2 billion. That means that the projected deficit at existing levels is only between 1% and 2%. It seems obvious that there is much more money available from cutting an existing program than from tinkering with the programs proposed. There should be a rule that any new program has to be funded by cuts somewhere else in the budget. The three top new big ticket items promised include more police, $14.3 million; infrastructure repairs, $11. 3 million, and more funding for the “arts,” $5.5 million. My call, fund only the infrastructure repairs, because the streets are crappy and spending more on them now saves money later. What services should be cut? 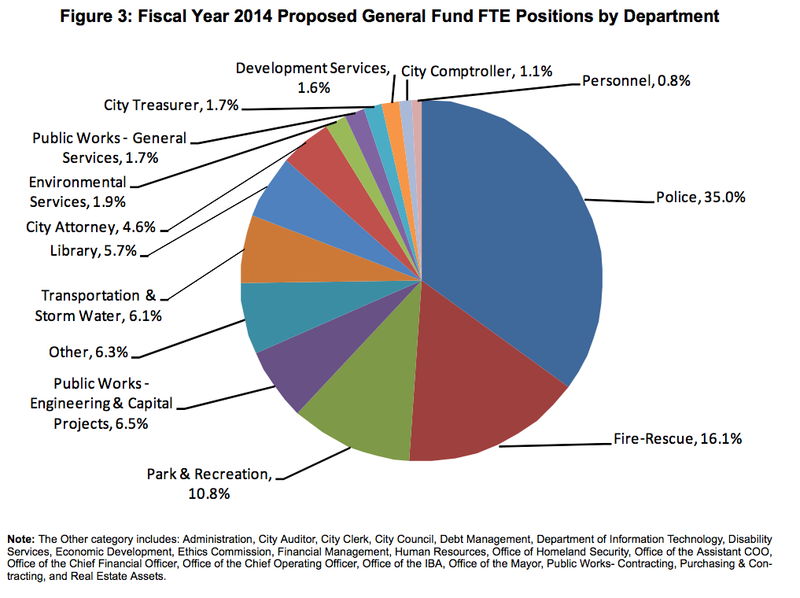 It turns out that Police and Fire make up just over half of the general fund expenditures. Before we reflexively say that public safety is most important, we should ask if the level of police and fire protection is good enough. How do our crime and fire rates compare to similar cities? Also, looking through the 2014 budget also reveals that $1.3 million in savings from managed competition for Fleet Services were removed from the budget, by Mayor Filner, I presume. If managed competition is to save money, we have to stick to the “as bid” savings. I would cut the library services, as I believe that libraries are an anachronism. In the 2013 budget, the new central library added $2.4 million to city expenses over the $39 million already budgeted. You could get a lot of street repairs done for that kind of money. Nathan Fletcher says that budgeting is about making hard choices. I’ll believe him when he advocates a cut to library services. Dean notes that the “fix is in” regarding the #ACA and correctly analyzes why the President’s latest proposal will also fail. Bonus for the left, the President continues to move the country into “rule by decree” lawlessness characteristic of say Venezuela. KTCat analyzes why this is never going to work and Left Coast Rebel details the lawlessness. 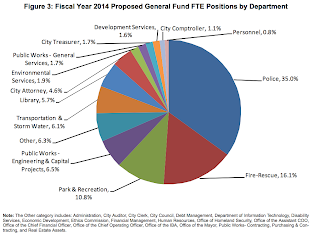 Notice how the Budget Projections and 5-year Financial Outlook only include an annual $3 million to the General Fund from the Redevelopment Property Tax Trust Fund (RPTTF) distribution of Successor Agency assets. As it related to former CCDC Redevelopment Agency Dissolution oversight, the City Council has failed to hold Civic San Diego accountable. Without correct financial number from Civic San Diego and the IBA, the projections cannot be completed. Due to incompetence and hiding assets, Civic San Diego is responsible to return $166 million in hoarded Non-Housing Successor Agency assets, including over $100 million in Cash, to be divided between the City and County General Funds. The City gets 21% or an additional $35 million this year to the General Fund that is not included in the 5-year Financial Outlook. La Playa, I add my kudos. Hopefully Faulconer, as audit chair, can look into this. La Playa getting kudos on Rostra. There is hope for the world.